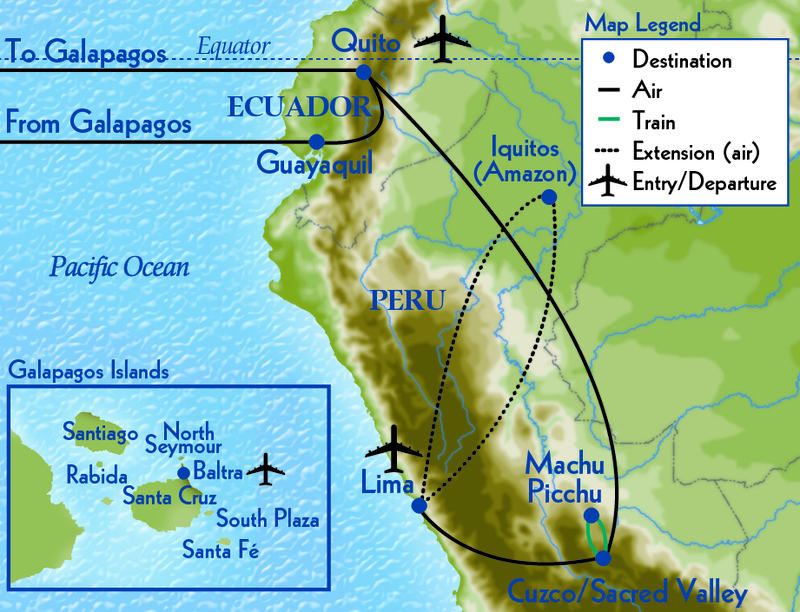 They rank as two of South America’s greatest treasures, and a small group tour is the natural selection for both: the enigmatic ruins at Machu Picchu, where we overnight at an intimate on-site hotel; and the fascinating Galapagos Islands, Darwin’s “living laboratory,” for a four-night island-based adventure. Day 1 : Depart U.S.
Day 15 : Depart for U.S.
Day 16 : Arrive U.S. Note: Tour schedule is subject to change due to local conditions. Many excursions in this program involve an element of walking as some of the finest attractions are located in areas not closely accessible by motorcoach. Join Tar Heel Travel’s listserv, and don’t forget to connect with Tar Heel Travel on Facebook and Twitter. All 2019 prices and itineraries (including port order) are tentative and subject to change; final pricing adjustments may occur after the release of marketing materials.